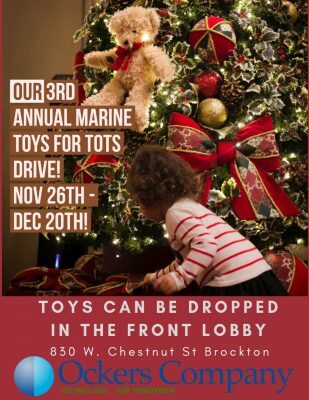 Our 3rd Annual Marine Toys for Tots Drive! Happy Holidays from the Ockers Company! We will be a “Marine Toys for Tots/Boston Toys for Tots” drop off location again this year. We will be accepting gifts until December 20th to ensure the gifts are distributed before the holiday. In the holiday spirit, if you are able to donate an unwrapped toy we will be collecting them in our main lobby. Thank you! MISSION: The mission of the U.S. Marine Corps Reserve Toys for Tots Program is to collect new, non-violent, unwrapped, toys each year and distribute those toys as Christmas gifts to needy children in the Greater Boston community.